Bonda a typical South Indian snack. 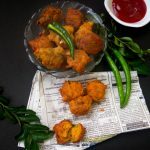 Medhu Bonda is a easy and quick version of Bonda, made by mixing besan, rava to a thick batter and deep frying. Don’t wait for a rainy evening as an excuse to try out this recipe. 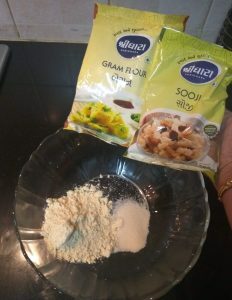 🙂 Besan flour and Rava used for preparing was a compliment received from Dhara Foods Pvt Ltd. Thanks to Dhara foods pet ltd. The company offers a wide variety of high quality products in the name “Shridhara”. 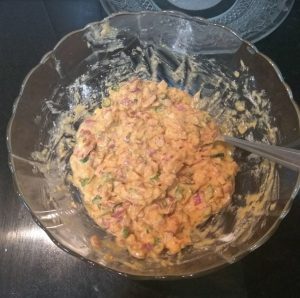 In a bowl add besan flour, rice flour, rava, red chilly powder and salt. 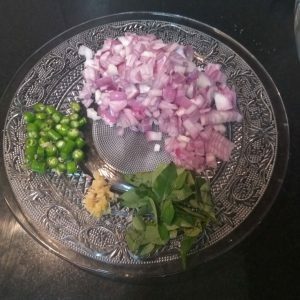 Finely chop onion, green chillies and ginger. Now add water to the mixture and mix well to form a thick batter. Add in chopped onion, green chilli and curry leaves. Mix well. Add 1/4 tsp Baking soda/ Cooking soda to the batter. 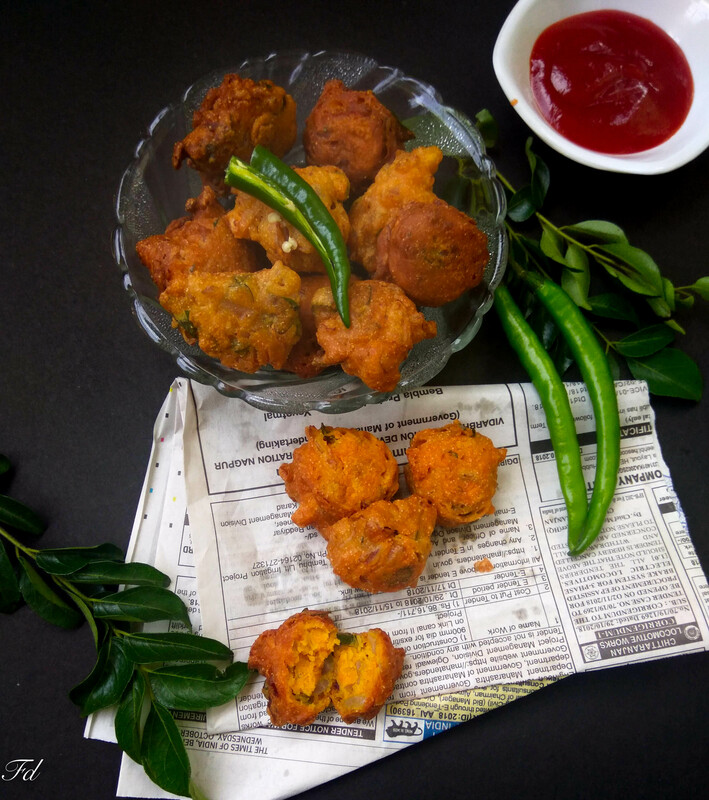 Heat oil in a fry pan, take small amounts of batter and drop it gently in batter to form round shaped bondas. Fry in medium flame to get even. Serve it hot. *Heat oil and deep fry in medium flame. *Add baking powder and take small sized round bondas for frying, this helps to cook properly from inside. * You can make variations by adding your choice of finely grated vegetables to the batter like carrots, cabbage etc. 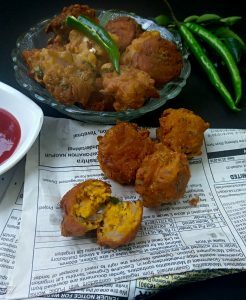 Check out the Kerala style sweet Bonda Sugiyan Here. 1. 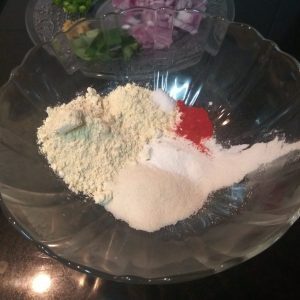 In a bowl add besan flour, rice flour, rava, red chilly powder and salt. Finally chop onion, chillies, ginger. 2. Now add water to the mixture and mix well to form a thick batter. Add in chopped onion, green chilli and curry leaves. Mix well. 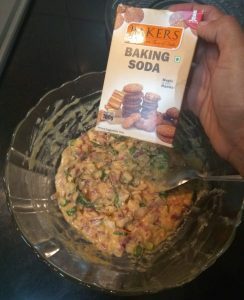 Add 1/4 tsp Baking soda/ Cooking soda to the batter. 3. 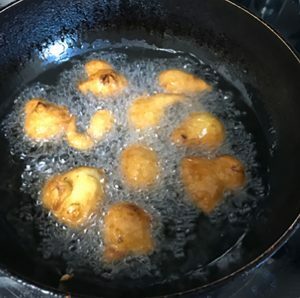 Heat oil in a fry pan, take small amounts of batter and drop it gently in batter to form round shaped bonda. Fry in medium flame to get even. Serve it hot.